Are you ready for your first job in sales? Do you have experience in the leisure or hotel industry? Are you fluent in German or are you a native speaker? Are you commercially driven and pro-active? Would you like to work for an informal fast growing e-commerce company close to Amsterdam where you can grow and start your sales career? Then we are looking for you! This role is interesting for a starter with a commercial bachelor’s degree or for people that have gained a commercial apprenticeship (“Ausbildung”). By contacting our B2B partners in the hotels, you will ensure that the hotels on the HotelSpecials websites offer better prices and have more rooms available for our customers to book. Next to the negotiations, you will also take care of the administration of your deals. Your challenge: “provide our guests with their perfect stay with more value for money”! As part of a price winning e-commerce company you will have enough data for your sales pitch. You will check prices and availability of competitors on a daily base and you know exactly which deals deliver the most for the customer, the hotel as well as for HotelSpecials: a win-win situation. It gets more exciting! Of course you want your deals to be booked and become a success. Therefore you work closely with our marketing department in order to inform our customers about our deals via Facebook and newsletters. In total we offer more than 4,000 hotels on our website. Next to the competitive prices and the rooms, our main USPs are our Specials through which we built a strong market position for ourselves during the last 15 years. You are not alone! You will work in a nice and enthusiastic Team DACH for the label HotelSpecials. The team consists of 2 Account Managers Support (including this one), 1 Junior Account Manager, 1 Medior Account manager and 1 Senior Account Manager. The team is led by a Team Lead who ensures targets are challenging but realistic. At BookerZzz, we want you to grow! That’s why we value people with a strong motivation and ambition to become better at what they do. You should have a positive working attitude; a “yes, we can” mentality and outstanding communication skills. You are not afraid to ask questions and to share your ideas with us. BookerZzz is a fast-growing company that offers consumers the best short stays in Europe. Through 12 websites in 8 different countries, we offer deals for more than 4,000 hotels and over 700 holiday parks. Thanks to our customer orientated approach, we help more than 1,000,000 happy customers per year to experience their perfect stay. We work with over 100 dedicated and enthusiastic employees in 2 European offices. Our Mission: provide our guests with the perfect stay with more value for money, hassle free. Within our company and to our customers we live the core values Full of Action, Interaction and Specialist. Does that sound like an organization you would like to join and contribute to? Please feel welcome to visit us for a cup of coffee at our office! 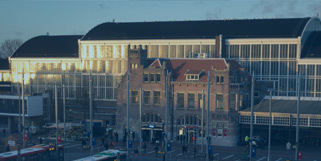 Our office (HQ) is located directly in the city center of Haarlem, just next to the central station, only 15 minutes by train from Amsterdam. What do we offer you? We have great benefits! A healthy and social working environment including fresh fruit, weekly office drinks and lots of social activities and legendary parties. Not actively looking for another job but feeling curious? Please feel free to come and visit us for a cup of coffee! A reference check and an assessment can be part of the application procedure. Do you think you are the candidate we are looking for? Please submit your application via the ‘apply’ button on this page. We are looking forward to your application! You can also explore this vacancy in German.